Azure policies are inherited by all child resources. So when an Azure policy is applied to a resource group all of the resources in that resource group will adhere to the policy that is applied. Another key feature in Azure policy definitions is that you can utilize parameters. Within either a Policy or Initiative you can define a set of parameters. These parameters can be passed values when assigning the policy definition. Utilizing parameters in your definitions means you can build a policy definition once and re-use it for different scenarios. After you have decided on a set of built-in policy definitions or built your own you then need to apply these in your Azure environment. Applying policy definitions is done by assigning a definition. Definitions are assigned to a specific scope. Scopes can be a subscription, management group, or a resource group. It is recommended to use management groups. Management groups are aligned to a subscription or a resource group. If you are not familiar with Management groups go read my blog post on them here. In the following screenshot, you can see what the configuration looks like for a definition assignment. Take note in the scope field I am assigning it to a management group and the management group is scoped to a subscription. Here is where Initiative definitions have an advantage. You can group a set of policy definitions inside of an Initiative definition and then assign the Initiative definition vs having to go an assign multiple policy definitions one at a time. Adding multiple policy definitions to an Initiative can be seen in the following screenshot. Within definition assignments, you can set exclusions. Exclusions allow you to make items exempt from a policy definition assignment. Items that can be excluded from a policy definition assignment are Individual resources, resource groups, and subscriptions. You set exclusions when setting up your policy definition assignment. 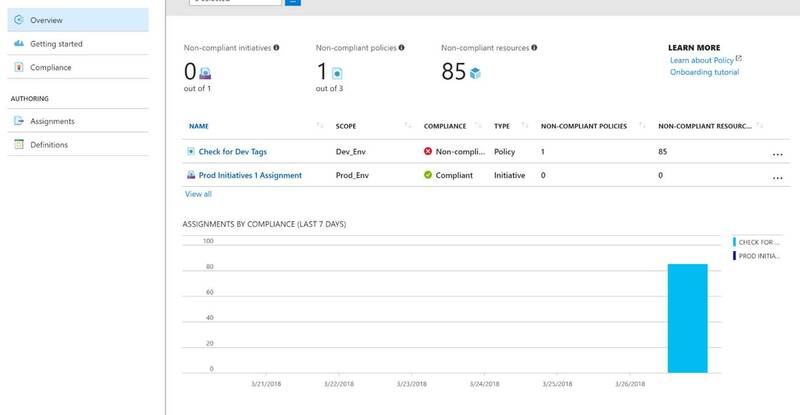 After a policy or initiative definition is assigned to a scope Azure policy then evaluates the compliance state for all the resources in the assignment scope. This evaluation happens every 24 hours. The evaluation is also triggered to scan a new resource when a new resource is created within a scope (management group, subscription, resource group) that has a definition assignment applied to it. 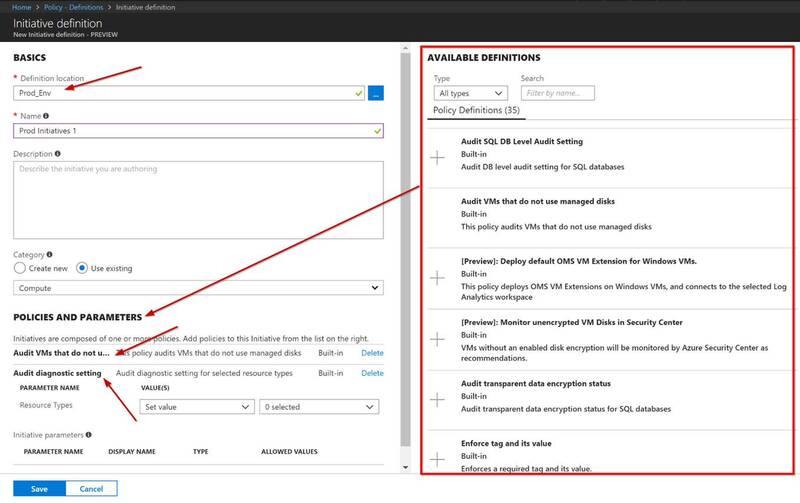 Keep in mind Azure policy is in preview so I am sure on-demand evaluation and the ability to set the evaluation interval is coming. You can see an example of policy evaluation results in the following screenshot. This shows the non-compliant and compliant items in the Overview pane. You can click on a definition assignment that non-compliant resources to see what those resources are as shown in the following screenshot. Azure Policy is still being enhanced. 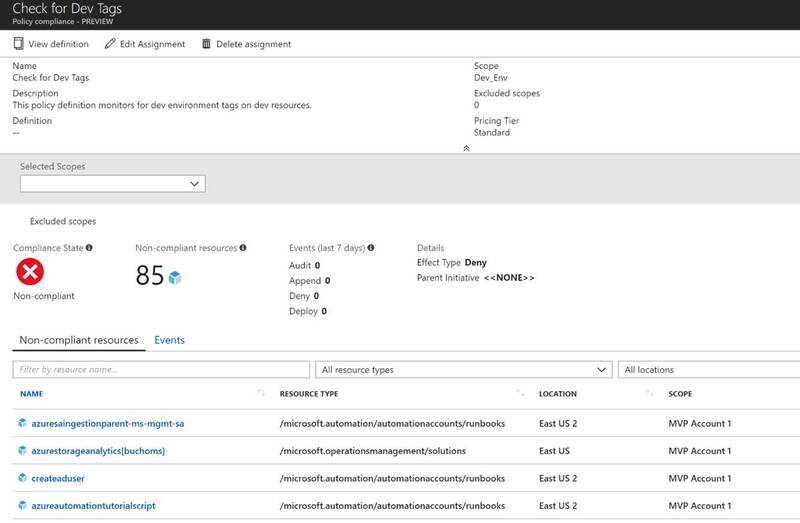 It is a critical part of your Azure governance and management. Again I highly recommend to start using the service even while it’s in preview. I hope you enjoyed this overview of Azure Policy. A friend of mine and fellow MVP Sam Erskine has started a 4 part blog series focused on Azure Policy. Sam’s post can be found here: http://itprocessed.com. As a next step, I recommend checking this out for a deeper look into planning and working with Azure Policy.